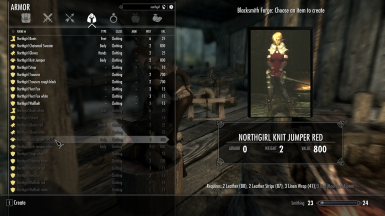 Small esp change to Northgirl to turn the items into clothing for mages. You may NOT re-upload or use this mod without my permission. Big thank you to anka01 for allowing me to change the esp. 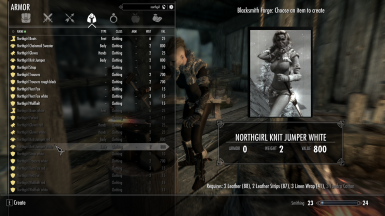 Please go endorse Northgirl Armor by anka01, and not this one. They did the beautiful work, I just changed some numbers around. 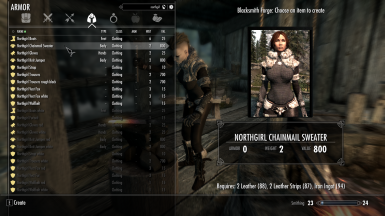 This is a simple esp change to the popular Northgirl armor by anka01, 1.2.1. Items are now clothing instead of leather. Items no longer have armor values. Recipes for items have been changed to support linen, where acceptable. Recipes for different colors have been changed to include plants to dye them.